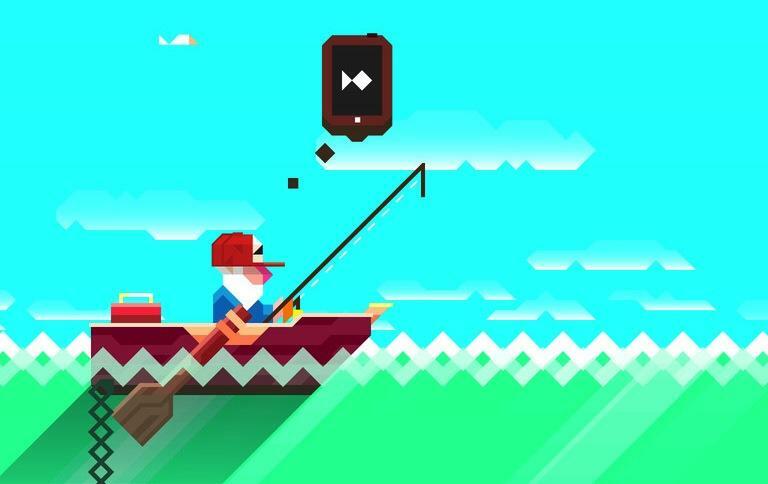 Ridiculous Fishing is a highly stylized iOS game that takes the quaintness and strategy of fishing and completely turns that practice into utter chaos—almost like an 8-bit game of Duck Hunt. Instead of catching one or two fish to survive, players are tasked with hooking as many fish as possible, and then obliterating them with guns and chainsaws. And toasters. It's absolutely insane and hilarious, and deceptively addicting. You play as Billy, a man who is on a quest of redemption from his uncertain past. But instead of relying on your typical bait and tackle, Billy employs a full arsenal of firearms and household items to ensure no fish is left standing. If ever there was a really, really, really manly way to fish—aside from using a spear—Ridiculous Fishing would be it. Billy is tough. Developed by Vlambeer and Spelltower's Zach Gage, the game takes the premise of the browser game Radical Fishing, also made by Vlambeer, and pretties it up for mobile devices. The 8-bit graphics are incredibly charming, and the music is fun and catchy. The goal is a bit odd; the entire game is odd. When you first drop your line, you're supposed to avoid the fish by tilting your phone (or iPad). But once you either reach the end of your line or snag a fish, Billy will start reeling em in. This is when you're supposed to catch as many fish as possible. That's when all heck breaks loose. Once your line hits the surface, the fish you snagged will fly into the air, like they've been shot out of a cannon, and that's when you start shooting. The mechanics are very simple, but they all combine to make what is a pretty fun experience. This isn't your average game, and it certainly isn't like sitting back in a small boat and doing a catch and release. Not when Billy is around. And how often do you get to shoot handfuls of fish raining down from the sky? The premise and pixelated artwork make for a unique and fun, if a bit odd, gaming experience. Each time you play, you'll earn money for the fish you catch. This in-game money can then be spent upgraded your arsenal of goods, which will in turn make the game that much more enjoyable. Ridiculous Fishing is currently just $2.99 in the iOS App Store, and it's available for the iPhone, iPad and iPod touch.